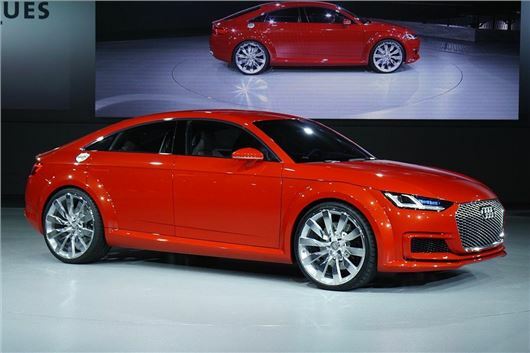 The longer, lower TT Sportback is powered by a 400PS TFSI petrol engine. There’s no word on a production model but there is a good chance of it going on sale in future, priced from around £30,000. The rear row has space for two people in individual seats, with a storage compartment in between. The back rests can be folded to improve load space, while up front the dashboard has been inspired by an aircraft wing. The large, digital instrument binnacle seen on the TT Coupe appears and replaces traditional analogue dials. It can also display mapping information, which can be controlled and zoomed via a touchpad, using smartphone finger gestures. The 2.0-litre, 400PS petrol engine sends drive to all four wheels through a seven-speed dual clutch transmission. 0-62mph takes 3.9 seconds.